Messages from the womb of the dawn. Shalom Friends,It is the Feast of Tabernacles time here in Israel and all the signs of the times are pointing to a great harvest ingathering in these last days! 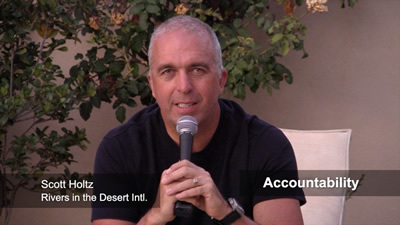 Here is a short video manna teaching to dial you’ll into greater faithfulness to Abba in this harvest hour. You have most likely heard a plethora of reports in the last 12 months about “weapons grade” nuclear weapons in the news due to the aggressive quest our enemies here in the Middle East (i.e. Iran) are pursuing. It is interesting to note that this topic has been slowly played down in the West as of late and diluted to a regimented format instead for discussions on dialogue, talks, and sanctions against Iran. 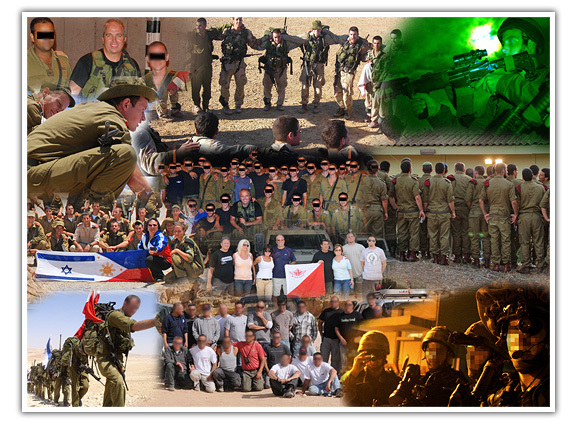 In the meantime while all this smoke and mirrors have been going on, those who have been called by Abba to protect this tiny Nation of Israel have been training intensively for any contingency that may soon arise. Yesterday, my youngest son and I had the great privilege to visit a friend whose sole responsibility is to be the guardian over the skies over Israel. During our drive down to his air wing base, I noticed the roads unusually full, not only of holiday travelers, but also convoy after convoy of military ground units heading to destinations unknown this Passover holiday season. I could not help but intercede for all these young men and women (including our oldest son), who are willing to sacrifice their lives to keep this Nation safe against a very, very aggressive enemy on all sides. It is a unique feeling to be here with a holiday period that reminds me a bit of our 4th of July in the States with all the camping and barbeques going on, but to see such military alertness not found anywhere else in the world! The stakes are so high here that you can just feel Divine Providence everywhere! As we arrived at the IDF air base I just could not contain my excitement. Not only because it reminded me of when I was younger and my father being a pilot in the Strategic Air Command (SAC) in the late 1960’s, but also the smell of jet fuel amongst a kibbutz styled pilot community I always read about. I remember begging my father when I was a kid in the local synagogue that we need to move to Israel and help them but he would keep saying no they don’t need us! So I kept looking in the back seat to see if my youngest son reaction was anything like mine was almost 40 years ago. And yes, he was smiling ear to ear with such simcha (joy) that he was entering a zone that few have ever been invited into! Oh yes! He is flowing in the family calling (LOL)! If only his grandfather could see him now!!!! Our friend perfectly choreographed this visit as we were just in time to see 2 F-16’s taxi out of their protected bunkers and head out on patrol just a few meters next to us. We followed them closely in the vehicle all the way out to the designated runway and positioned ourselves at the exact point where they would begin to go airborne. We were then invited to get out of the acoustic safety of the vehicle and stand next to the runway at the spot where these warriors in full afterburners and loaded with heavy poundage of fuel begin to rotate off the ground at 200+ knots. The noise was overwhelming and the ground shook with power as these guardians of the sky thundered past us and lifted off almost vertical and then banked towards the South of Israel. I again looked over at my son and as a parent knew what was happening and why we were here…. This youngster one day will be called to follow in the footsteps of his fathers and become another handpicked warrior to guard the Nation of Israel. I could not hold back the tears…. I thought our VIP style tour would be over at that moment, but to our shock we were invited to see a surprise gift, and we quickly found ourselves within a few minutes standing next to a squadron of aircraft ready for battle. 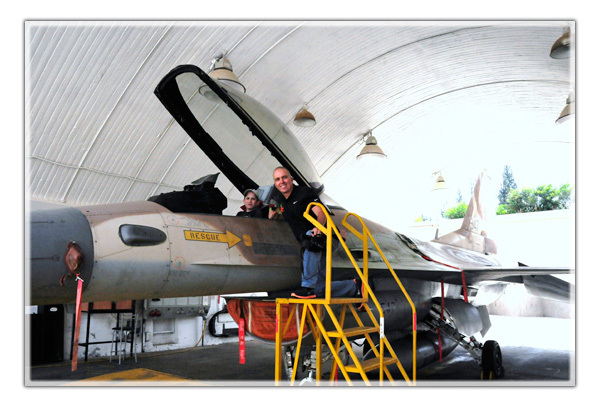 As our host guided us around the aircraft and explained the weapon systems, avionics, pilot training for the IDF…. My mind kept wandering thinking what these aircraft have been involved in the last 2 decades (Lebanon, Gaza, Iraq nuclear reactor, etc…), and also what these aircraft will be involved doing in the days ahead with the threat of a nuclear Iran and Gog/Magog. Our host then shook me out of my thoughts and then invited my son to sit in the pilot seat of one of the most illustrious weapons and squadrons in the IDF! I then looked at his watch as he helped my son into the cockpit and it read 9:11! It was at this moment I began to feel the Holy Spirit come upon me and I could see the development of what I can coin to you’all this morning as “weapons grade specialists”. Without a doubt, our children are called in these last days to be specialists in battle for the Commander and Chief of the Lord of the Armies of Heaven! Take a moment and read this link of Isaiah 8:13-18. It is the reference given for the last days battle of Hebrews 2:9-15 that will be delivered thru our children! And the context is the terrorism against Jerusalem of Isaiah 7! Think of it…weapons grade specialists/ warriors not only in the natural military but also in the upcoming generation of windward believers. Desert Shepherd Warriors on the pattern of the last days revelation of the Messiah in all His glory to conquer His enemies! This is where the community of faith is heading and it is towards producing highly refined weapons grade specialists who will do exploits on the order of David’s mighty men! This is the heart of David being refined in all of us in these last days as we stand for Israel’s survival in this demonized Middle East! And this is the people we are working with here….. They say one picture is worth a thousand words and this one is so spot on…. Have a super blessed and refreshing holiday weekend! Thank you for believing and loving us for such a time as this! PS, Let His love and Spirit wind fill you with the extravagant joy of giving to keep re-supplying our ops here. We are in regions where the good news has never been proclaimed with power. It is so amazing what God is doing here to comfort His people per Isaiah 40! We have pioneered new things never seen before here and you’all are co-laborers in this Genesis 12:3 blessing! See below how you can help these urgent needs…. 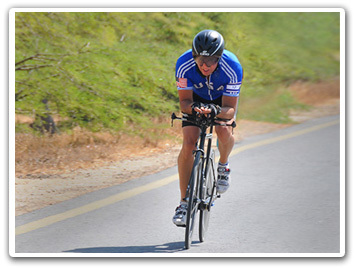 The testimony of the 2009 Maccabiah Olympic adventure in Israel! This is a massive download from Abba about a mysterious mountain range in Israel that in the Scriptures is the key to NT warfare and the apocalyptic grand finale! In this fresh update from Israel you will be amazed at the Scriptural precedent that proceeds from this subject of Mt. Bashan and why we must follow heavens directive that was birthed here! This is the finest place for equipping for the champions of God I have seen anywhere in the Biblical redemptive narrative! And it is here in Israel and we have secret access to it!!! It is all coming together why Abba has sent us here to pioneer a new thing for the new warriors of God! You battle axes and weapons of war (Jeremiah 51:20)! It is time to get encouraged and fresh ammunition for your sectors of responsibility! It is a winter white-out here in Northern Israel this weekend with a large storm coating the mountain’s ridges of the Hermon with beautiful frozen precipitation! This is another excellent addition of water for this drought stricken country while at the same time our national joy is being buffeted by the renewed rhetoric of war coming from our Northern enemies. Therefore it is time for a tactical examination of what the strongman of the Prince of Persia (Iran) is cunningly crafting with his Islamic antichrist armies against our tiny country and inhabitants! What is the most effective way to comfort God’s chosen people per the command of Isaiah 40:1-3? And is this now being done by the plethora of pro-Israel efforts by believers? What is the key strongman needing to be plundered behind Iran’s quest for tactical nuclear weapons? What will the next war against tiny Israel look like that is different than past Islamic campaigns? Is Iran planning to capture Northern Galilee towns with the newly armed/trained brigades of Hezbollah commando’s? Do most Israeli’s believe in Gog/Magog per Ezekiel’s prophetic oracle of ominous implications? Will there be a successful missile attack upon Israel in the near future? Has the liberal “Tel Aviv” establishment become so desperate for peace that it has critically negated the founding ethnos of this country? How can Spirit filled believers step up into this vacuum and effectively war this conflict into a resounding victory? …And not another UN bartered standoff. What are the urgent needs facing our family here in Israel? And how you can help. We have included below some recently de-classified photos of one of our many special ops in the Mt. Hermon region that is buttressed up against Lebanon and Syria. This highly sensitive alpine area is a key to Israel’s early warning capabilities for survival against our enemies. We are working with leaders in the North who not only believe, but also have seen the power of the shofar soundings that have flushed out many who are demonized serial terrorists! The regions of the underworld are being exposed and plundered thru this ministry’s boldness and tactical prophetic ambushments! Glory to God! Enjoy the fresh spiritual feedings this latest audio podcast has to offer and know that your support for these tactical prophetic ambushments is producing fruit that is beyond current description. We love you’all and are standing with you for God’s best in your sectors of responsibility! PS, $102,307.04 is the updated amount we are needing to continue the stealth ministry here. We announced to you’all last week that our family has given everything we own/saved to pioneer this new work here the last 30 months. We are now in a urgent need and may have to leave Israel and return to the States to itinerate. We view this as a cunning strategy of the underworld strongman to get us out of Israel by disrupting our supply lines of support. So dear friends and partners please do not underestimate how dangerous you are to the strongman here when you lift up your precious seed for Israel’s salvation! Set your face like flint with us and let’s keep attacking his underground infrastructure here that hell can be plundered of its slave labor force! Glory to God!!! Great doors of utterance for the Gospel have been given for us here, yet there are many enemies…. In this latest Audio Podcast Update, I discuss this sophisticated warfare front developing against us here as well as several other vital alerts for this late hour. Today’s communiqué is geared to encourage and manifest in you more robust faith for exploits in your sectors of responsibility. 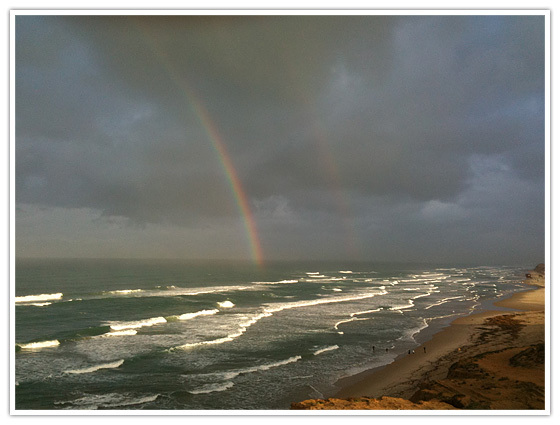 It has been a wild weekend here in Israel and so let’s get you’all updated right away! As I have been diligently pressing into the new thing of “Ground Zero” in my heart to be totally available for the Holy Spirit’s beckoning call, something always manifest like clockwork, yet is so alien to many believers worldwide. And this alien thing has to do with exploits against the underworld! If you are a believer and living in compromise then this last sentence will send out signals of fear and trepidation towards self preservation. But if you are a believer walking the highway of holiness (Is. 35), then just the mentioning of doing exploits against the underworld causes you to salivate like Pablo’s dog! Glory to God! Warriors love to war…not just sit around and sing about it! Just this week in Israel, it has been reported all over the news of multiple mafia underworld operators being exposed. International believers who do not live here but do love the nation of Israel need to wake up and quit idolizing this place. Wake up and realize that there is here layer upon layer of mafia like corruption that makes the Italian mob in New Jersey look like Boy Scouts! Where did all of this corruption come from? Some of it has compliantly come from the black market mentality of the former Soviet immigrants who now number over 1 million. Some came from the Jewish crime families that immigrated from Arab countries. But really most of it is a recent phenomena of the rebirth of the days of religious corruption in Jerusalem from the religious leaders just like it was in the days of Jeremiah (Jer. 7)! The religious system here is so corrupt and deceitful that there is no shame anymore! This is not the same Israel of 20 years ago many people (lamenting while they say it) tell me nowadays! It is a mighty fine war we are in here…please pass more ammunition! The shofar soundings are really shaking up things nicely here! PS, $103,007.04 is the updated amount we are needing to continue the stealth ministry here. We announced to you’all last week that our family has given everything we own/saved to pioneer this new work here the last 30 months. We are now in a urgent need and may have to leave Israel and return to the States to itinerate. We view this as a cunning strategy of the underworld strongman to get us out of Israel by disrupting our supply lines of support. So dear friends and partners please do not underestimate how dangerous you are to the strongman here when you lift up your precious seed for Israel’s salvation! Set your face like flint with us and let’s keep attacking his underground infrastructure here that hell can be plundered of its slave labor force! Glory to God!!! Great doors of utterance for the Gospel have been given for us here, yet there are many enemies…. A fresh audio podcast on how you can find that ground zero place in your heart and thus make the necessary preparations to catch the thermal currents of the new thing He is now invisibly warming in the earth. I for one do not want to miss this new thing by allowing myself to be dull of hearing or stubborn and not ready to give up the old wineskin. It is so easy to love the old wine that you do not press into the new He has for us! Enjoy this audio podcast and may His word shake and bake you in the ground zero of His glory zone! It is time to shed the old and once again metamorphosize into being people of the windward realm! The term “ground zero” is used to describe the point on the earth’s surface where an explosion occurs. In this communiqué it is the term given to me by the Holy Spirit to describe what is happening here in Israel. 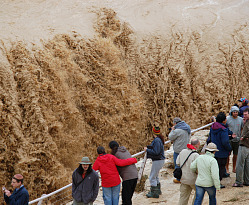 Last week’s historic flashfloods in the “ground zero” dry riverbed of the ancient prophet Isaiah’s oracle is a sign to all of us that a new thing has begun (see link). What that new thing entails is only known by the mysterious Divine providence of God and He will do it suddenly to surprise all those who might say, “Oh yeah, we already prophesied that would happen” (Is. 48:3-11). This then behooves us as NT warriors who are joyfully consumed to please Him, that we must find the spiritual “ground zero” in our hearts where real change can only begin. Unless we break open the alabaster box of our secret chambers to be flooded by His will, then we will run the risk of missing this new thing that He has now inaugurated on the earth as is seen by this radical sign of Isaiah 43:18-21. Therefore, I have put together a fresh audio podcast on how you can find that ground zero place in your heart and thus make the necessary preparations to catch the thermal currents of the new thing He is now invisibly warming in the earth. I for one do not want to miss this new thing by allowing myself to be dull of hearing or stubborn and not ready to give up the old wineskin. It is so easy to love the old wine that you do not press into the new He has for us! Enjoy this audio podcast and may His word shake and bake you in the ground zero of His glory zone! It is time to shed the old and once again metamorphosize into being people of the windward realm! Dalit and our family have a special appeal this week for a extra renewed source of donations for the ministry here in Israel. We have poured everything we have personally into this new work and are asking our friends and partners to do the same. We just want to be like the Macedonian believers (2 Cor. 8) who experienced the grace of the Lord Yeshua the Messiah in such a deep way that they just begged for the opportunity to give to help bless God’s people in Israel. Please prayerfully yield to His grace and do help us with some immediate living expenses that is over and above the Special Ops projects listed below. Help keep us here in the Land and not having to move back to the USA to itinerate for long periods of time. We must be here on location and continue our nightly runs against Islamic terror, drug smugglers, Jewish mafia, and forms of evil unseen before here since the days of Sodom and Gomorrah. The enemy does not want us here and yet can’t touch us…so he has been cunningly attacking our supply lines (partners) to keep them off balance. The need is critical and feel free to email me if you would like to know the exact amount now needed. It’s been a great and victorious campaign here in Israel, and we now need extra ammo and supplies to continue. It would be easier to move back to the States but we have been fashioned by Him to be warriors and we need to stay in this war here…so please send a extra parachute drop of needed supplies soon! Thank you for all your love gifts and prayers for us these last 30 months and lets together keep counterattacking these vicious serial killing warlords that are wanting to terrorize, dominate and control God’s people and His chosen land! There are so many miracles against the strongman here that it could make a great documentary…. But we have been instructed to continue to stay stealth…and in that we will obey for His Glory! A NEW THING HAS BEGUN…ARE YOU AWARE OF IT? Massive flashfloods have hit the deserts of Israel this week and now yesterday the Northern Galilee city of Nahriyah was flooded. Nahriyah in Hebrew means the “River of God”! Wow! Could we be seeing a prophetic watershed event happening before our very eyes that requires us to activate now? I have been called to be a Holy Ghost weatherman to declare to the Body of Messiah when the Israeli deserts known as the Aravah/Yishimon suddenly experience record breaking flashflooding. It is based on Isaiah 35 and 43:18-21, and is the key prophetic event in the Scriptures you can hang your hat on when activating yourself to catch the new wave that God is mysteriously sending upon the earth! Even the Messiah’s return is featured like a flashflood in Isaiah 59:19-20! My morale is peaked out right now dear friends because two days before this unexpected flooding hit here in Israel I was in prayer again asking Abba for major signs and wonders to break out to arrest the attention of believers worldwide to what is happening here in stealth secret. 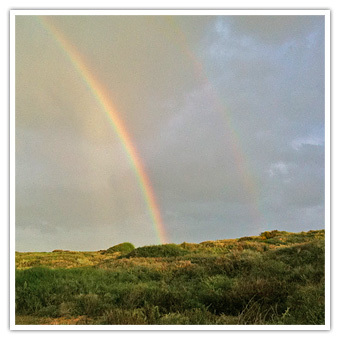 This is a follow up to the same thing that happened two weeks ago with the double rainbow appearing at a spontaneous prayer location at one of the Special Forces bases! I’m stunned and yet very peaked out and ready to sprint in a all out race to see and carry His glory! The earthquakes, shakings, financial troubles, rumors’ of wars, etc…is just the beginning of the birth pangs coming on the earth (Matthew 24). We need to be clothed in endurance to stand up to the big test planet earth is in right now! Keep lifting up your heads because our redemption is drawing nigh!!!! I have put together a audio podcast this morning to help explain the Scriptural precedent of why God uses the desert environs of Israel to signal to His chosen people the new thing He is doing in the earth. Don’t get caught up in all the presumptuous speculation out there in the media or mystical prophetic crowd…instead look directly in the Scriptures to the precedent He has placed in the desert environs of the Promised Land! Enjoy this audio podcast and let it be kerosene for your spiritual fire to pick up the pace in this final race for lost souls!!! And here is the same riverbed in flood stage today! The epicenter of this ministry is centered in declaring the new thing God is doing in the earth according to the ancient prophetic oracle of Isaiah 43:18-21. When God does a new outpouring of His Spirit worldwide it is preceded by a ancient prophetic sign based in the geography and watershed of Israel. It is called the Yeshimon desert and is one of the most barren wasteland on the earth. However, when it receives a rare deluge of flashfloods then it is God’s declaration that He is doing something new and unprecedented in our generation! Glory to God!!! 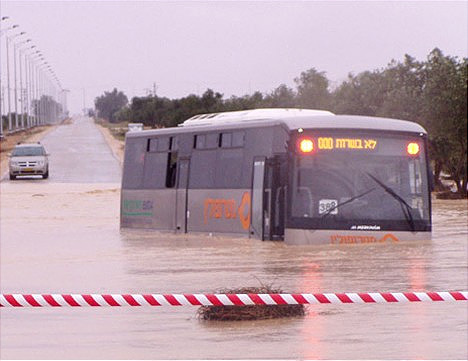 Today massive rainfall has deluged the south of Israel on a scale not seen in over 40 years! 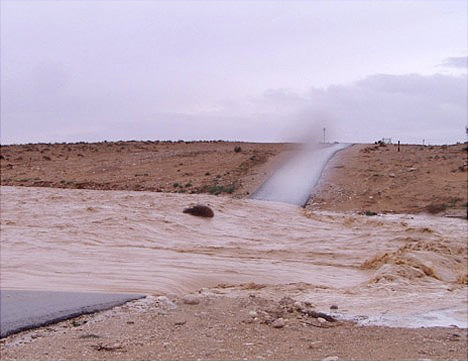 More rain fell overnight than the total amount of rainfall in the Negev for the past 10 years. Israel is stunned and all roads in and out of this region are either washed out or closed early this afternoon. Magnificent waterfalls and rapids have broken out all over the deserts of Israel and this water is draining right into the Yeshimon desert of Isaiah 43:18-21! In the next few weeks the desert should be beautifully carpeted with wild desert flowers and greenery, which is the exact terminology used by Isaiah to describe the new highway of holiness found in Isaiah 35! Dear friends, something new and unprecedented is now upon us! Get your spiritual surfboards re-waxed and your wetsuits ready…a new gullywasher of the Holy Spirit is on the way! Did you know that Israel’s salvation and spiritual awakening is directly tied to this flashflooding event per Romans 11:25-26 which is a direct reference to Isaiah 59:19-20! And the One coming in like a flashflood is not the enemy, but according to the Dead Sea scrolls is the Lord Messiah Himself! It is time to sound the shofar and wake up His army in this late hour! We are here to service your faith! Don’t be bewildered or full of fear about what is now shaking on planet earth and amongst the nations! A new wave of His glory is on the way!!! A couple years ago while ministering in Atlanta, GA. I was taken up in the Spirit of God and saw a major offensive being planned against the Body of Messiah from deep within the enemy’s camp. It looked like a storm or squall line of dark clouds suddenly rolling in like you would experience in the Summer months on the plains of Oklahoma. The next thing I saw was many believers going about their daily activities totally unaware that this attack was about to hit and that they would also not understand even where this attack was coming from until it was too late and that the damage was done. 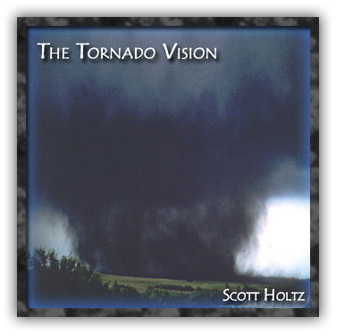 During this same time I also received a sudden rush of Internet orders for our 1995 teaching tape THE TORNADO VISION and then a young man who receives many accurate dreams (verified by his pastor in Oklahoma) suddenly calls me out of the blue describing to me these dreams of a sudden storm system coming with many tornadoes! As the prophetic hydraulic fluid pressure continued to build within me that something very dangerous was coming… suddenly later that weekend the United States was hit with the most tornadoes ever in one day! Then to top these things off 90 minutes later I’m invited to sound the shofar of warning on a live international TV program by Juanita Bynum! Those who saw the broadcast can attest to the Awe of God that invaded that interview and shofar soundings! (We were subsequently invited to minister at Juanita Bynum’s The Threshing Floor camp meeting the at the Georgia Dome with an expected audience of 80,000 plus people!). Let’s now examine some key end time Scriptures about what this storm is…. Notice here that the word love is “Agape” (the God kind of love) will wax and grow cold in the hearts of believers during the last days before Jesus return to planet earth. This is a very serious warning and we must not be caught off guard to this epidemic of apostasy and secret falling away that is now happening. But let’s look even deeper into the context of why and how this is happening…. It is found in the verses proceeding which has this progression. …And out of this environment many false prophets will arise and mislead many (Matt 24:11)! So it is not just the false prophetic and lawlessness we need to try to avoid and combat in the front-lines…it is OFFENSES (in our flank) that is the bottom line weapon that the enemy is successfully using to wear down God’s people in this final hour! THE WARNING I SEE OF THE COMING STORM UPON THE HORIZON IS THAT OF A NEW WAVE OF OFFENSES, STRIFE, AND DIVISIONS BEING RELEASED FROM THE GATES OF HELL AGAINST GOD’S PEOPLE! We need to NOW then take evasive action!!! But How? I suggest we all right now look into a subject to strengthen our faith muscles for the love walk and that subject can be coined as CONFLICT RESOLUTIONS. Because this storm I see coming is very, very evil and cunning and we must be ready…. Jesus is warning in the Last Days that a lawlessness will erupt and evaporate the Love of God from believers hearts (Matt. 24). This will be centered around offenses and betrayal. Proverbs 5 and 7 describe the portal to Hell is illustrated by a wicked adulterous woman who is very cunning and tempting. James 3 describes this woman as the wisdom which comes from below…earthly, natural, and the epicenter of all demonic work. And portal of all demonic work is characterized by strife, jealousy, and selfish ambition. (See James 3:14-16)! ….AND the warning from James is for us not to be arrogant and lie against this truth! What is our first step of Evasive Action? DEATH! Take up our cross and die to self ambition, self justification and only obey the Word of God! We must be brutally honest with ourselves and not lie against the searching Truth of His Word! James says the wisdom from above is first pure… That means we must radically take inventory and cleanse ourselves of all worldly pleasures and stimulations. Purity in speech, thought, and what you allow into your eye and ear gates concerning electronic entertainments. Be Holy and be blameless in your conscience is a pre-req in this hour! Take up the attitude of Hebrews 13 of being a scapegoat and going outside the camp bearing the reproach. (Very rare character trait seen today). Recognize that the enemy’s secret but very lethal weapon of first choice to take us down is by strife and division. He will strike repeatedly at the areas he smells the most flesh of self ambition and a Cross-less lifestyle. He will send offense which will usually ride on the back of jealous believers, family members, and then strangers. He wants to create a division… a wedge…and operate from that launching point. Don’t give him place! Stay in continual alertness and RECON mode for offenses and strife. Matthew chapter 18 (please read this chapter now). If your brother or sister offends or sins against you…go directly to them First! (not anyone else or the justice system of God is not in your favor). If they do not listen…bring in witnesses who know intimately of the situation or are directly affected by this offense and will be the next step in line to receive fallout and the collateral damage of this persons sinful and lawless actions. Then you bring it before the local church (that is why it is good to be part of a God ordained gathering place of believers in a NT pattern). If there is still no repentance then you treat that person as a heathen and tax gather…not reject them and cut them off…but rather love them unconditionally as Jesus did the heathen and tax gathers in His earthly ministry. However, to often the guilty person is treated as a heretic and outcast and unknowingly that silent treatment and distancing by believers (i.e acting like beavers in their secure lodge) is what cements the division that the enemy has wanted all along! Time does not allow me to go into more Scriptures this morning concerning love, unity, restoration, etc… But let me sum up some concluding thoughts for you dear warriors. In the last 25 years of ministry, I have seen that usually the hardest group to get “un-offended” are full-time ministers. They think that just because the anointing of God is manifesting in their services and they are doing so many good works that they are above the Judicial precedent of The Word of God. In so many past Matthew 18 conflict resolutions I have either been involved in or was asked to be a part of I have noticed that many ministers or believers who are well seasoned in the things of God have a big “Achilles Heel” of self delusion. They (and even I have been guilty before) of placing prophetic words, or what they hear in prayer as having more precedent than the written Word of God! We must not dance around the topic and be arrogant and lie against the truth. It does not really matter what we have heard in prayer or received in prayer or prophecy from others because that can come forth from a impure conscience or hurt and the enemy loves to play upon this with very cunningly craftiness. WE MUST OBEY THE LITERAL WORD OF GOD! PERIOD!! Take this short teaching this morning and let us search our hearts. Be brutally honest and then have the courage to contact that brother or sister who has offended us or we them…and reach out the hand of unconditional love and reconciliation. Go to them first and them only…. And even if they don’t listen calibrate yourselves to keep up the momentum to keep talking to them no matter how long it takes to bring in those who are acting accountable only to themselves. Don’t give up and do not get tempted into a place of anger or frustration… Stay in that place of gentleness and the inner shalom that you will experience supernaturally as you are a warring peacemaker! The storm is upon us all…are actions will determine our destiny. Be courageous and go that extra mile to maintain unity no matter what the cost! 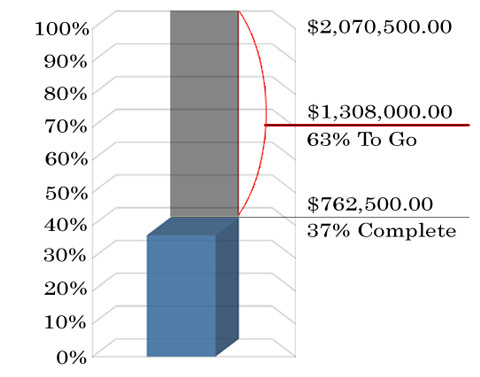 PS, $107,707.04 is the new updated amount needed to complete our latest fishing expeditions here in Israel! I wish I could share more testimonies of the great open doors for the good news here! For those of you who love Israel and want to bless them, then this is a great place to invest. It is stealth, adventurous, radical, never been seen before, wild, fruitful, amazing, and many more descriptive words can be used! Just yield to Him and He might let you know what is happening here that is blowing our minds! Thank you for your love and generosity! The demons are overdosing on prosaic about what is being pioneered here (LOL)!!! Recently in the shahar of the morning dew worshipping The Lord of The Armies of Heaven at a special forces base, I began to ask the Commander and Chief to give me a sign of His perfect will about our pioneering work here to raise up a new breed of warriors on the pattern of the ancient Judges and modern special forces. 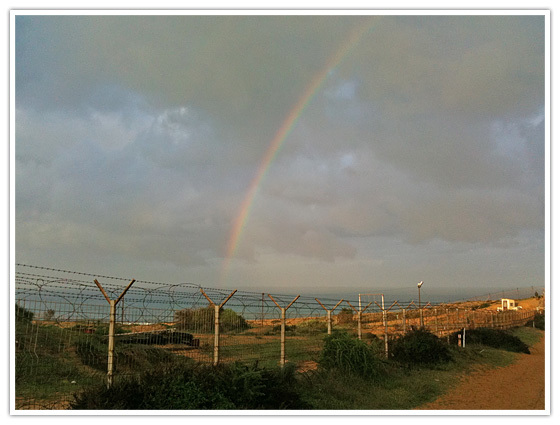 Suddenly I was so startled when a beautiful full rainbow appeared with dozens of IDF special forces training just below it’s arch! The soldiers, the officers, and myself just were stunned! I quickly pulled out my iPhone and took some pictures and video of this rare event. In this audio podcast, I will share some secrets I have used to stay the course, not give up, and thus have shed off over 40 pounds thru a Spirit-pleasing practice of diet and exercise. What sets these secrets apart from the plethora of fitness centers, books, programs, equipment, virtual web sites, and most of the highly educated trainers of our contemporary culture is this…we are exercising inside out from a well that never runs dry! It is all about yielding and not just “working out”! 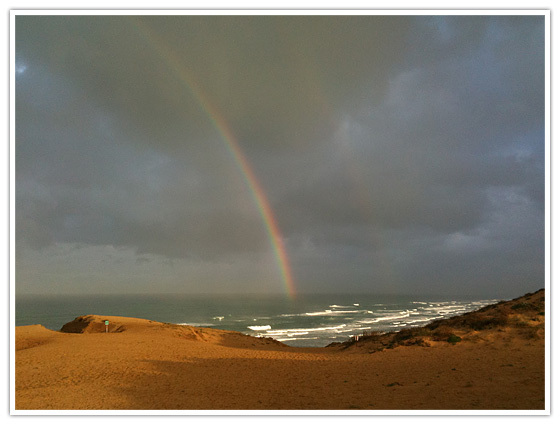 I have another atmospheric sign to share with you’all from Israel! This week I was up in the shahar of the morning dew worshipping The Lord of The Armies of Heaven at a special forces base. In this time I began to ask the Commander and Chief to give me a sign of His perfect will about our pioneering work here to raise up a new breed of warriors on the pattern of the ancient Judges and modern special forces. 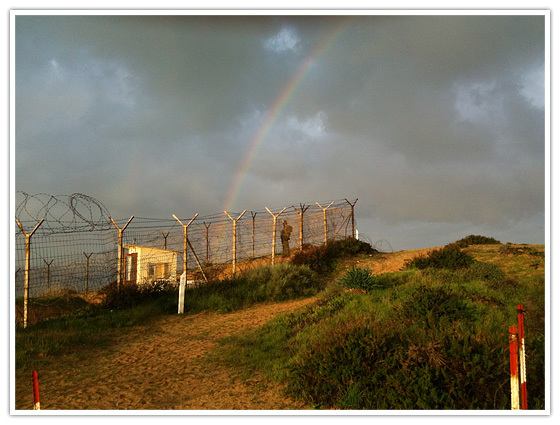 Suddenly I was so startled when a beautiful full rainbow appeared with dozens of IDF special forces training just below it’s arch! The soldiers, the officers, and myself just were stunned! I quickly pulled out my iPhone and took some pictures and video of this rare event. I hope this short video will help you’all see how what is being pioneered here is so drenched in His perfect will and without a doubt is in perfect sync with this new move of God for Israel! I have some real powerful secrets to share with you today that will revolutionize your quality of life. This is not something I read in a book or viewed on a video link. These are time-tested disciplines I have used to train myself and other warriors to find that place of physical fitness that God has pre-ordained all of us to walk in! Our bodies (temples) belong to God, and He wants to use them as instruments (weapons) of war in this late hour! This is so exhilarating! So come draft behind what we are pioneering here for not just a healthy and better quality of living, but also another great tool for soul winning and tactical offensive ops against evil! It is time to run with the chariot horses of God per Jeremiah 12:5! In this latest audio podcast, I will share some secrets I have used to stay the course, not give up, and thus have shed off over 40 pounds thru a Spirit-pleasing practice of diet and exercise. What sets these secrets apart from the plethora of fitness centers, books, programs, equipment, virtual web sites, and most of the highly educated trainers of our contemporary culture is this…we are exercising inside out from a well that never runs dry! It is all about yielding and not just “working out”! So join with us as we become that radical Gideon’s band of men and women who are buffeting themselves to be His champions per I Cor. 9:24-27! Video documentary of prophetic tornado visions and the subsequent tornados that came 6 months later in the same location!